Doubtless - Charity Joy (H.K.) (g. by Not a Single Doubt). 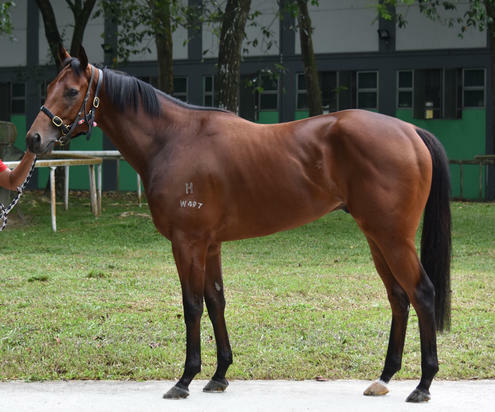 5 wins-1 at 2-at 900m, 1000m, NZ$7,810, HK$5,485,600 in NZ and HK, HKJC Poplar H., King Kwong H., Tai Shue Wan H., Tai Mo Shan H., 2d HKJC Chak On H., Queen's Road Central H., 3d HKJC Shum Wan H., Yan Chai Trophy H., Hong Kong Golf Club Centenary Cup, Hong Kong Lions Cup, Albert H., Crystal H.
Nowhere Man (g. by Darci Brahma). Winner at 1600m in 2015-16 in NZ. Darc Bounty (g. by Darci Brahma). See below. Mam'selle Rouge. 2 wins at 1600m, 2050m, MRC Brattle H., SAJC Allan Scott Park Morphettville H., 2d MRC Special Dane H.
Our Favorite Miss. Winner at 1200m, BTC City Pacific Finance P., 2d BTC OPI P., QTC Mercedes-Benz C-Class H.
Miss Elusive. Winner. See above. Yocto. 6 wins-1 at 2-to 1200m in Aust. Captain Invincible. 4 wins-1 at 2-to 1400m in Aust. Tides of Fortune. 3 wins to 1200m to 2016-17 in Aust. EXCLUSIVE HALO (Don't Say Halo). 5 wins-3 at 2-to 1400m, A$153,130, VRC Maribyrnong P., Gr.2, Maribyrnong Trial S., L, MVRC Southern Cross Apartments S., L, 2d MVRC Accor Asia Pacific H., VATC Australian Racing Writers Welter H., Kingston Town H., 4th VATC Zeditave S., L.
MISS JUGAH (Jugah). 10 wins. See above. Exclusive Reign. 5 wins-1 at 2-to 1300m, A$105,980, SAJC TAB Now at Lucky Horseshoe H., Distinctive Lifestyle H., Kokoda H., 2d SAJC Philips Medical Systems H., Distinctive Lifestyle H., Distinctive Lifestyle 2YO H., Skycity Adelaide Cup H., 3d SAJC Morphettville Junction H., 4th SAJC Fulham Park P., L. Producer. Rose or Gina. 3 wins at 1100m, 1200m, BTC Castlemaine Perkins H., Moet & Chandon H. Producer. Rich Moss (Twig Moss). 2 wins at 1200m, 1300m, WATC Terrace H., CIG Oxygen Graduation S., 2d Western Australian Guineas, Gr.2, WATC St Leger, Gr.3, Summer Wine Welter H., Cossack Graduation S., 3d WATC Tattersall's Cup, L, Winker H., Excelsiar Graduation S., Westralian Graduation S., 4th WATC Winter Cup, Gr.3, Fairetha Quality S., L.
Exclusive Heiress (Vain). 2 wins. See above. Race Record: 2 Starts 0-1-0 S$15,693.